Police in the English town of Cleveland are investigating what they are labeling a homophobic hate crime that left a gay man with burns to his calves so severe, he needed skin grafts. 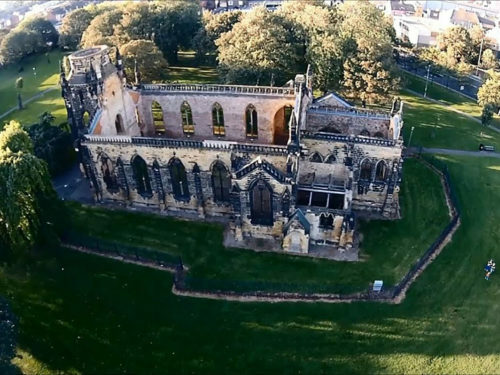 Early Wednesday in the park surrounding the burned-out shell of Holy Trinity Church in Stockton-on-Tees, police tell PinkNews that four men approached the 20-year-old victim and stopped him to ask personal questions about his sexuality. The young man ignored their taunts and proceeded toward the street. That’s when one of the men snuck up behind him with an aerosol can. He sprayed it at the victim’s legs, then set him ablaze. The victim described his assailant to police as a white male in his early 20s, with short blonde hair and medium build, who at the time of the attack early Wednesday morning was wearing jogging shorts but no shirt.